AMD’s FX platform is going through a Renaissance period, despite all forecasts of a quick decline – in the past few months we have gotten a number of new AM3+ motherboards plus a new and improved stock cooler called Wraith. Gigabyte has caught this trend and the Taiwanese company has revealed a new flagship AM3+ motherboard with an updated feature set called 990FX-Gaming. The new Gigabyte motherboard supports all AMD AM3 and AM3+ processors including the 220W TDP models that AMD has – the FX-9590 and FX-9370 – and offers a number of nice features that even include support for USB 3.1 and M.2. The board comes with a 10-phase VRM system and employs an 8-pin power connector as well as a 24-pin ATX power connector. The 990FX-Gaming is a board that is obviously based on the AMD 990FX chipset too – the board has four DDR3 DIMM memory slots for up to 64 GB of DDR3 memory and the manufacturer claims the 990FX-Gaming even comes with support for DDR3-2400. As to expansion the 990FX-Gaming comes with three PCI-E 2.0 x16 slots with the last one being connected to the AMD SB950 Southbridge, which makes it work at x4 speed. In addition to this the new motherboard has six SATA 3.0 connectors, a M.2 slot for SSDs and other peripheral devices that can use it, high quality Japanese Nichicon Muse capacitors, Killer E2201 networking, a TI Burr Brown OPA2134 user-replaceable OPAMP, ground-layer isolation, two USB 3.1 ports and four USB 3.0 connectors. The board is powered by UEFI BIOS and has Gigabyte’s dual-UEFI as well. 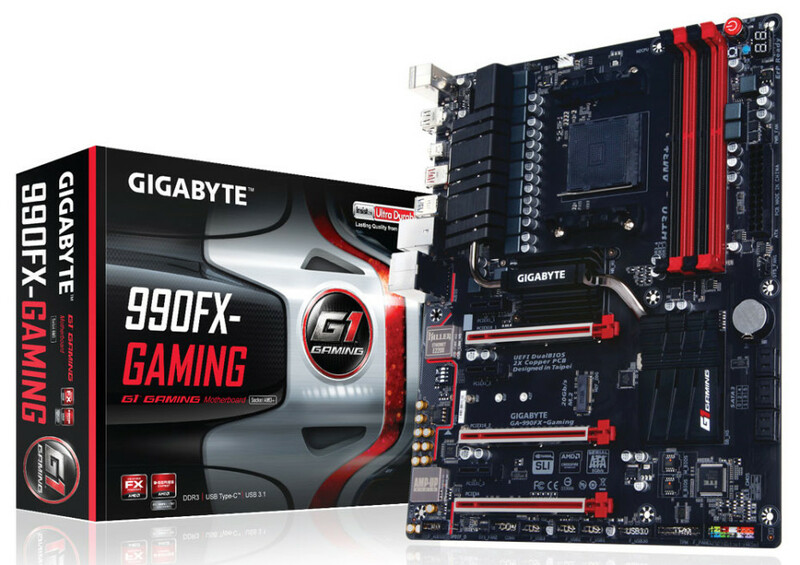 Gigabyte prices the 990FX-Gaming at USD 150.